Our experts can dry your basement and get it ready to make the most of your remodeling investment. To schedule a basement upgrade quote, contact us by phone or e-mail today! 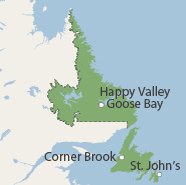 Our experts serve throughout the Newfoundland and Labrador area, including Conception Bay South, Corner Brook, Gander and nearby. At N.L. Basement Systems, we've seen just about everything that can happen to a finished basement, and we've been called in to waterproof them daily. Once the basement is finished, repairing and waterproofing the space is much more expensive. The systems we install at N.L. Basement Systems also include an alarm system that sounds off in the unlikely event of a pump failure -- so you can respond right away. It costs you nothing to meet with us for abasement quote! Our specialist can stop by to measure your basement, make recommendations, and answer any questions you may have. While we're there, we'll create a customized plan for your basement, including a written cost quote. Our experts proudly provide quotes to the Newfoundland and Labrador area, including Gander, Conception Bay South, Corner Brook, the surrounding areas of Cormack, Massey Drive, Deer Lake, Bonne Bay Pond, Spaniards Bay, Cape Broyle, Reidville, and nearby.